It is Hubby again celebrating the good news. Alice had her post-treatment PET/CT scan this morning and we met with the Oncologist this afternoon. While we were not expecting any bad news, it was good to hear from the “horses’ mouth” that everything looked fine with the scans and there was no evidence of disease (NED). What was even better, as far as Alice was concerned, was that the good news was initially delivered by none other than Dr. McG as in DrMcdreamy. Alice wants me to call him just Dr. G as in “G for Gorgeous”. If you all remember, he is the good looking 6’8″ doctor with excellent bedside manners and exhibiting extreme competence. As it turns out, Dr. G was doing his turn as a Fellow in the Oncology clinic working with Alice’s Oncologist (another Dr. G as in Michelle G). Dr. McG explained to us some of the results of the PET/CT scan and told us that there was nothing to be concerned about. A little later, we had a short session with both Dr. Gs and we were told to go ahead and re-plan our trip to India and start to live our life normally. I had been thinking for a week or so about how we were going to celebrate the good news but had no real plan. However, having run into Dr. McG the only thing I could think of was to make a big pitcher of margaritas and invite Alice to help me drink it. So we stopped at a State Liquor Store on the way home from the hospital and bought a bottle of tequila and margarita mix to go with it. I always thought that nothing symbolizes celebration better than a margarita. Besides, I knew that Alice, who is a non-drinker, liked margarita more than any other alcoholic drink and this was the only way for me to do a “one up on Dr. McG”. Also, we may not see him any more as the next appointment for Alice is 3 months away. 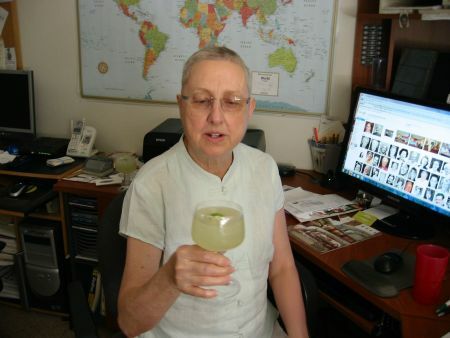 Here are a couple of pictures of Alice helping me with the margarita. You can also see that she is not wearing her wig in the pictures and her hair is about half an inch long. I am trying to convince her that she really does not need her wig any more. I am sure that she will stop being self conscious in a week or so. As I expected, we are at a loss. We had always expected the good news, but now that it is here, we are not sure how to deal with it. I am sure you all will help us. 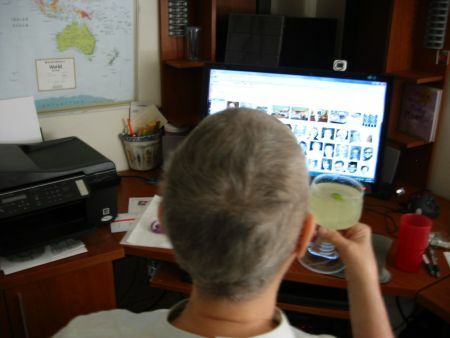 This entry was posted in lower-case cancer, Personal and tagged cancer, celebrations, hair, margaritas by Alice. Bookmark the permalink. I’m a non drinker but I’ll toast to her good health with my good ole diet coke! That is wonderful news and I am so glad to hear it. Getting back to “life as usual” is probably easier said than done but thankfully the scare is behind you and you have a wonderful trip to India to look forward to. Alice your hair is coming in great and in my opinion you don’t hve to wear those wigs. Lots of women choose that length as their hair style. Wonderful news! I am dancing about my kitchen with delight! How exciting to have a second chance at life – a new beginning – go make the most of every single day! Ditch the wigs, people pay fortunes to have their heads shaved in order to achieve a look like yours! Just be careful in the sunshine the scalp will be tender until a full head of hair grows. Carry a sun-hat. Now where did I put my glass… CHEERS! We were just talking over breakfast about our new attitudes toward living life now. We won’t fret so much (I at least) about what we should do but what we enjoy doing. Thanks for celebrating with us. Join us again in six months when I have the next scan. It’s morning so I’m toasting you with a cup of coffee. YaY to the good news. NaY to the wig(s). You look adorable! Simply wonderful news. Off to India you go. That’s the best way to celebrate. PS: Tons of hugs for you both from us. I’m thrilled for you, Alice! And Hubby….you’ve been her rock the entire time. So bravo to both of you! Alice…I think your hair looks adorable! I’m serious! Not everyone could look that good with a really short cut….but you have certainly pulled it off! Not sure how to deal with it, huh? A few suggestions….smile a lot, laugh a lot with each other, smile a lot, do whatever you want–when you want, soak up sunrises and sunsets together, smile a lot, and most of all………just enjoy each and every moment, because aren’t they all so very special! You can star in my cheer leading squad any and every day, Terri. Thanks so much for always having the right words. Thank you all for your comments. It had been some journey and and we both are better people for it. You all have been a wonderful support group for Alice (and me too) during the past few months. We enjoyed our margaritas and late in the evening daughter#1 called and complained that she did not get any margaritas and so I made another pitcher and we took it to their house and celebrated again. Now I have decided to make margaritas every time we get good news after the follow up scans and we will post the news at this site. So any of you needing an excuse to drink margaritas please join us in celebration every time we post about Alice’s scans. I’m so happy to hear all this. I raise my (non-alcoholic) glass of soda to you. Alice, you look great. I got that haircut on purpose when I decided to stop coloring my hair. Couldn’t stand the thought of watching the color change millimeter by millimeter. Just think of it that way. Good idea Ruthe. Actually one of the reasons I delayed “going natural” with my color was the dread of that growing out period. Unless it looks much worse than it appears it’s going to, I don’t expect to spend money on color again! Hubby said YAAAAY. Far more things to worry about, right?! Dear A and P, I am so delighted with your wonderful news. You have had a roller-coaster 5 months and deserve all the margaritas you want to celebrate your victory. Because of the arthritis medicine I take daily, I also am a teetotaler, but I raise my cup of hot chocolate and salute you. Have fun on your trip. Hot chocolate works for me! But if you’re drinking it in this hot weather, you must have the air conditioner running. Thanks for stopping by. Hey, my hubby and i decided that we like the whole margaritas after we finish lifting weights in the basement thing…so, tuesday/thursday/sunday? Just call! We’ll be there.